VATICAN CITY (CNS) — Pope Benedict XVI said the family in Western society is undergoing a “crisis that threatens it to its foundations,” owing to false ideas of human nature that equate freedom with selfishness and present God-given sexual identities as a matter of individual choice to the profound detriment of humanity dignity. But the pope said that the Catholic Church, in its dialogue with states, secular society and other religions, can help restore a proper understanding of human nature as a basis for justice and peace. 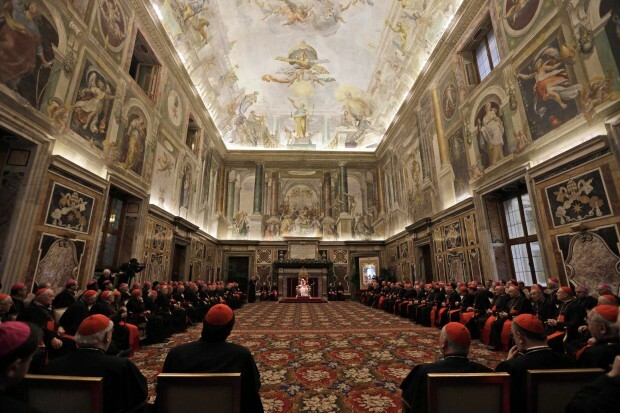 The pope made his remarks Dec. 21, in his annual Christmas address to officials of the Roman Curia, the Catholic Church’s central administrative offices at the Vatican. “The church represents the memory of what it means to be human in the face of a civilization of forgetfulness,” Pope Benedict said. Striking a more hopeful note, the pope said that the church can help secular society recover a true understanding of human nature. “The church represents the memory of what it means to be human in the face of a civilization of forgetfulness,” he said. Properly understood as a search for the “oneness of the truth,” such dialogue does not entail compromise of religious convictions, he said. The pope’s speech included a brief summary of his activities in 2012, including his March trip to Mexico and Cuba.